If you believe that talking about race is impolite, or that "colorblindness" is the preferred approach, you must read this book. 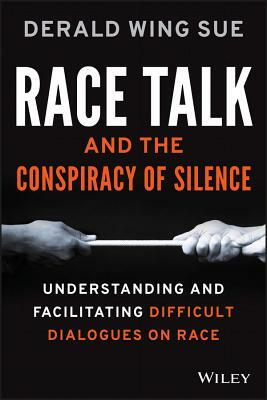 Race Talk and the Conspiracy of Silence debunks the most pervasive myths using evidence, easy-to-understand examples, and practical tools. "His insistence on the need to press through resistance to have difficult conversations about race is a helpful corrective for a society that prefers to remain silent about these issues." "In a Canadian context, the work of Dr. Derald Wing Sue in Race Talk: and the Conspiracy of Silence is the type of material needed to engage a populace that is often described as 'Too Polite.' The accessible material lets individuals engage in difficult conversations about race and racism in ways that make the uncomfortable topics less threatening, resulting in a true 'dialogue' rather than a debate." "He offers those of us who work in the Diversity and Inclusion space practical tools for generating productive dialogues that transcend the limiting constraints of assumptions about race and identity." "Sue's book is a must-read for any parent, teacher, professor, practioner, trainer, and facilitator who seeks to learn, understand, and advance difficult dialogues about issues of race in classrooms, workplaces, and boardrooms. It is a book of empowerment for activists, allies, or advocates who want to be instruments of change and to help move America from silence and inaction to discussion, engagement, and action on issues of difference and diversity. Integrating real life examples of difficult dialogues that incorporate the range of human emotions, Sue provides a masterful illustration of the complexities of dialogues about race in America. More importantly, he provides a toolkit for those who seek to undertake the courageous journey of understanding and facilitating difficult conversations about race." --Menah Pratt-Clarke, JD, PhD, Associate Provost for Diversity, University of Illinois Urbana-Champaign. Derald Wing Sue, PhD, is Professor of Psychology and Education at Teachers College, Columbia University. He was?Co-Founder and first President of the Asian American Psychological Association, and past President of the?Society for the Psychological Study of Ethnic Minority Issues and the Society of Counseling Psychology. Dr Sue?serves on the Council of Elders for?Cultural Diversity and Ethnic Minority Psychology. His current research explores the manifestation, dynamics, and impact of racial, gender, and sexual orientation microaggressions. He currently applies this research to strategies for facilitating difficult?dialogs on race in the classroom and public forums and conducts training sessions across the U.S. and Canada to help institutions improve relations among community members.